The image was taken by Mark Ezell on April 15, 2014 over the Capitol building in Austin, Texas. 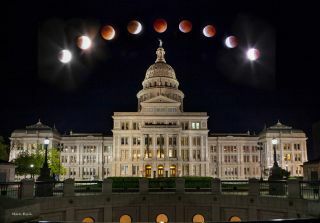 This stunning composite view of a recent total lunar eclipse captures the stages of the amazing moon sight as viewed over the Capitol building in Austin, Texas. The composite image was created by skywatcher Mark Ezell during the total lunar eclipse of April 15, one of two total eclipses of the moon in 2014. Ezell captured the individual images of the moon between the hours of 1 a.m. CST and 4 a.m. CST. The beauty of the building provided inspiration to Ezell. Ezell used a 70-200mm lens to photograph the moon during the eclipse, then photographed the Texas Capitol Building using a 24mm lens. The April 15 total lunar eclipse lasted about 3.5 hours, with the Earth's shadow slowing darkening the face of the so-called "Blood Moon" in a jaw-dropping sight for stargazers.